At sunset on a recent March evening, I drive through southern Colorado’s San Luis Valley into the small town of Monte Vista, home of the Colorado National Wildlife Refuge. I’m just in time to see the sky come alive with flights of sandhill cranes, coming in to roost. I’ve driven 250 miles from Denver for this, to reconnect with sandhill cranes. I got to know them in southwest Wyoming years ago, when they spent their nesting season in the fields surrounding our place. Each March, since I moved away, I think of how the cranes came to my husband and to me, the first harbingers of spring in our High Plains desert home. I park along the drive through the refuge where other people have stopped alongside a pond, watching the sky with binoculars and cameras at the ready. When I open the car door, the audio portion of the cranes’ arrival surprises me – it’s a din. The tremulous croaking sound unique to sandhill cranes, along with the calls and honking of geese that are also arriving, mingle with the trilling of blackbirds already settled in the cattails. In the dimming light the cranes come in waves, first high in the sky, then descending slowly toward the wetlands, and finally, moving closer to the ground, where they disappear into the tall grasses of their roosting spots and continue to make a ruckus. As they fly over my head, their wings, a 6-foot span, swoosh slowly and gracefully. Their long necks extend straight forward, their long legs extend straight back, until, finding the right roosting spot, they rotate their legs forward and down like the landing gear on planes. As the sun sets, darkening the enclosing mountains and sky, the din subsides, the birds settle, the temperature drops and I retreat to the warmth of my car. I’m thinking of finding a café and then my roost in a nearby motel. Next morning the alarm rings at 5 a.m. so that I can be at the refuge by 6 a.m., when many of the cranes depart. According to the refuge brochure, these particular cranes, a few thousand of which came to us in Wyoming in March, are part of the Rocky Mountain sandhill crane population, estimated to be 18,000 to 21,000 birds. When we watched them start leaving in October from our Wyoming fields, we loved how they spiraled higher and higher into the sky, until they were barely visible. Yet we could still hear them faintly calling to each other. These practice flights continued for a week or so, perhaps imprinting this location for their return. Finding just the right thermal finally, they disappeared. We knew they were migrating south, but not exactly where. Now I learn that most of them spend their winters at the Bosque del Apache Wildlife Refuge south of Albuquerque. They stop here in Colorado’s San Luis Valley on the way. Sandhill cranes dance in their winter home in Bosque del Apache National Wildlife Refuge, New Mexico. Sunrise over the San Juan and Sangre de Cristo mountains is worth getting up early for. A pink, lavender and Day-Glo orange sky contrasts with the peaks and reflects in the refuge’s ponds, turning the winter-bleached grasses peach and gold. A flock of around 50 cranes lifts up slowly, followed by another wave and then another, creating magnificent congestion in the sky, accompanied by a cacophony of throaty burbling. A loner circles back as if returning for something it forgot. There’s a lull, then just as I think the air show has ended, another huge flock rises up over the marsh. As the sunrise fades to gray and pale yellow, the action finally subsides. The spectacle has taken about a half hour. I decide to explore the nearby refuge-managed fields where cranes, which mate for life, mingle and forage. Thousands still carpet the fields, shoulder to shoulder along ponds and ditches. Occasionally, a crane leaps up flapping its great wings in the crane’s characteristic courting ritual. A couple flies off by itself, then the birds walk together with slow, deliberate steps, occasionally lowering their graceful necks to feed. Driving dirt roads around the fields in search of more sandhills, I realize the land is familiar. Small farms and ranches grow hay and grain in fields irrigated with snow melt from the encircling mountains. Sagebrush and native grasses grow where fields are not irrigated. If I didn’t know better, I’d think I was back in Wyoming. This re-acquaintance with cranes has triggered memories of the nurturing and familiar landscape we once shared. I know they will soon return to it. The knowledge that I won’t be there to welcome them for another season is bittersweet. 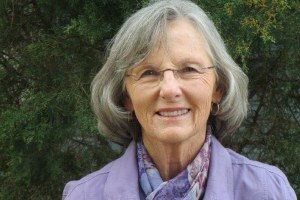 Marcia Hensley is a contributor to Writers on the Range, the opinion service of High Country News. She lives in the Denver area.